In Lake Tahoe, few areas are as renowned for their beautiful sunshine and abundance of recreational offerings as the famous Kings Beach. Between the Kings Beach State Recreation Area and Kings Beach Plaza, there are plenty of things to see and do here! Walk down by the crystal-clear waters of the lake on the soft, pristine sands of the shoreline. Plan a special outdoor event, or head out on the water for a great time kayaking, paddleboarding, or fishing. No matter what you decide to do, chances are good that you’ll have the time of your life! Fortunately, we offer a variety of Kings Beach Lake Tahoe Rentals to make your trip here special. Click below to see our Kings Beach Vacation rentals! Pairing exquisite lake and beach views with a convenient location, our Kings Beach vacation rentals offer a completely unique Lake Tahoe experience. Soak up the peaceful, laid-back lakeside ambiance of Kings Beach; here, you’ll find the best of beach and alpine vacations all rolled into one! Spend your days basking in the sun on the beach, or make some friends while playing on the volleyball courts. For nature buffs, there are a number of nature trails nearby for you to explore as well. Inside of these lovely Kings Beach vacation rentals, you can expect all of the creature comforts and conveniences of home. 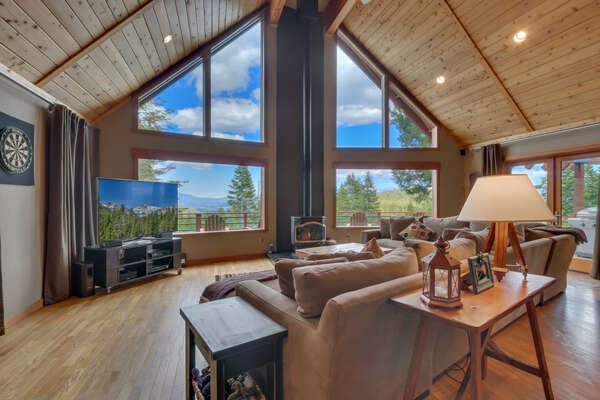 Plush furnishings, cozy fireplaces, full kitchens, high end appliances, spacious rooms, and ample privacy all await you in our Kings Beach vacation rentals, which place you within minutes of Kings Beach’s and Lake Tahoe’s most exhilarating activities and most fascinating attractions. You need only to walk out of your front door! Create gourmet meals in kitchens that would bring tears to a chef’s eye. Fully equipped and loaded with the finest appliances, the custom cabinetry, granite countertops, and views of the lake make these rooms the ones in which everyone gathers for meals and memories. The million-dollar views visible from the walls of windows in the living areas will take your breath away momentarily, and when it returns, the charm of the rooms won’t disappoint, either! Stone fireplaces help keep you warm on cold lake nights, plush sofas beckon you in and invite you to stay awhile, and large screen televisions allow for binge-a-thon showings of your favorite romantic movies. Heading down the hall (or up the stairs!) to the first of two, three, or sometimes four bedrooms, the carpet feels soft and warm against cold feet. Pop your head in the first guest room and you will discover a room designed with family in mind. All our Kings Beach vacation rentals boast large comfy beds, high thread count linens, and large windows expose even more of that view than you could see below. Guest baths with dual sinks and fluffy towels that are both warm and soft give proof that we treat each room, and each guest, with equal importance. Every room and every person deserve only the best. As we continue down the hall towards the master suite of your Tahoe vacation home rental, you can peak in on the other rooms along the way, decorated in happy colors and comfortable furniture each space is a haven. The master suites are spacious and grand, yet still offer a cozy and intimate sense of warmth; happy dreams and cute little snores will be experienced here! The master baths feature jetted tubs, dual vanities, and all the luxury amenities we love to sample during vacation. These rooms are designed to pamper our most cherished visitors. A lot of thought has gone into the details of making these homes the ones you never want to leave—let us know how we do, ok? A vacation in Tahoe promises to be one you spend the rest of your life thinking and dreaming about. It’s the one time in your life where everything will seem to go right! Enjoy hearty breakfasts at Log Cabin Caffe and Ice Cream (Ice cream for breakfast is a treat saved for vacations only!) followed by mornings spent sitting on the shores of Lake Tahoe with fishing pole in hand, not really caring if you catch a fish or not; it’s the quiet moments of contemplation that accompany any fishing expedition that mean the most. Afternoons are for napping, evenings are for sunsets on the deck of your Kings Beach vacation escape, and nights are for moonlight strolls with the one you love most. Tahoe is one of the most beautiful areas in all the world and there’s always something exciting and fun to do while you’re here! Contact our reservations team to learn more about our fabulous houses for rent in Kings Beach, CA and throughout the entire Lake Tahoe region when you book your vacation accommodations through Tahoe Signature Properties today!